Prevent clumps, easily apply false lashes, make your mascara last longer, and more! 1. Bend the brush of the mascara wand so it's easier to maneuver. As you pull the wand out of the tube, gently bend the tip so it's perpendicular to the handle. This new shape will make the brush easier to control and get to the harder-to-reach areas, like the tiny hairs toward the inner corner of your eye, when applying multiple coats of mascara to both your upper and lower lash lines. A brand new bottle of mascara can transfer a lot of extra product on the wand for the first few uses, causing clumpy lashes. So before your first coat, glide the brush over a napkin or tissue to remove any excess formula. 3. Keep your lashes curled longer by wiggling the brush back and forth at the base of your lashes, and then swiping to the tips. If you coat your lashes evenly, it will weigh down the tips of the hairs, causing your lashes to straighten out after a few minutes. The best way to hold a curl is to apply a thicker coat of mascara at the root of your lashes and a lighter one toward the ends. You can achieve this by wiggling the wand back and forth at the base, and then lightly combing through to the tips. 4. Layer waterproof mascara on top of your regular formula to make your mascara last longer and make it easier to remove at the end of the day. Waterproof formula is great at holding curl and keeping your mascara from smearing throughout the day, but because it's so difficult to remove, try applying your normal mascara first and finishing with a coat of waterproof. If you have thin or light-colored lashes, coat both sides by alternating between looking up and looking down while applying mascara. That way, the hairs are fully covered and appear much thicker. 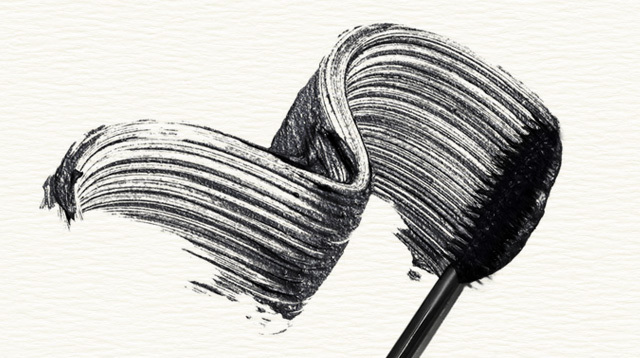 The way you hold the brush when applying your mascara can make a huge difference. Holding the brush horizontally and wiggling it back and forth will give you voluminous lashes, while holding it vertically and running the tip of the brush along the length of your lashes will leave you with a longer, more natural look. 7. Soak your mascara tube in a cup of hot water to make the formula liquid-y instead of clumpy. This will make the formula thinner and easier to apply. If you're down to the bottom of your mascara tube and it hasn't reached its three-month expiration date (you should always toss your mascara after three months to prevent any eye infections), try setting a closed tube of mascara in hot water to loosen the product from the sides so you can use every last bit. 8. Hold a spoon underneath your eye when applying mascara on your lower lashes to avoid getting marks on your skin. Place a spoon below your eye with the curved side facing out, and then apply your mascara like you normally would to your lower lashes. That way, the mascara will land on the back of the spoon rather than your skin. This trick also works when applying mascara on your upper lashes. 9. Make your mascara do double-duty as a gel eyeliner. 10. Dust baby powder over your eyelashes between the first and second coats of mascara to plump up your lashes. Translucent powder or baby powder has grip, so it will stick to your lashes in between each coat of mascara, making your lashes appear more voluminous. 11. Spin the tip of a cotton swab over a dried mascara mistake to remove the spot without ruining your eyeshadow. If you accidentally touch your eyelid with mascara after you've applied your eye shadow, wait for the spot to dry, then place the tip of a cotton swab on top of the spot, and spin it until it's gone. If you try to remove the mark while the mascara is still wet, you'll smear it and make the problem worse. 12. De-clump your mascara by combing through your lashes with a clean toothbrush. Grab a new clean toothbrush (a used toothbrush could lead to irritation or infection), and comb it through your lashes from root to tip. The bristles will grab the excess mascara and leave you with clump-free lashes. 13. Create the look of thicker brows by using a mascara in the same color of your arches to darken, fill in, and set them. First, wipe off the excess product on a napkin so you're not left looking like Groucho Marx, then brush your brows in a slightly upward and outward direction. This will help thicken and fill in your brows, while also setting the hairs in place. 14. Apply mascara on your roots to hide regrowth or gray hairs. If you're in a pinch and need to cover up some gray hairs or root regrowth, grab a mascara in the same shade as your hair color, wipe off the excess product along the neck of the mascara tube, and brush it directly onto your roots. 15. Curl your lashes with an eyelash curler while applying mascara at the same time to keep them curled longer. If your lashes tend to fall straight, clamp your eyelash curler at the base of your lashes as you apply your first coat of mascara. The wetness of the product can make the curl fall out of your lashes, so reinforce them with a curler as you apply your first coat. 16. Heat your eyelash curler with a blow-dryer so your lashes curl more easily and hold the shape longer. Blow warm air onto the lash curler with your blow-dryer until it heats up, wait until it cools slightly (test the warmth on the back of your hand first to make sure it won't burn you), and then curl your lashes as normal. This trick creates curled lashes the same way curling your hair with a curling iron does. 17. Rotate the angle of the eyelash curler for an even more intense curl. To create big-curled lashes, clamp them at the very base, press the curler together lightly, and hold the lashes in place for a few seconds. Completely release the clamp and move it about halfway up the lash hairs while turning the curler at an angle parallel to the ground. Clamp and hold again. Finally, move the curler to the tip of the lashes, and give one final press, turning the lash curler almost upright. 18. Curl your lashes with the edge of a spoon. If you don't have an eyelash curler nearby, use a metal teaspoon instead. Place the edge above your upper lashes with the back of the spoon against your eyelid. Then, with your finger, lightly press the base of your lashes against the edge to mimic the clamp of an eyelash curler. Finally, move the edge of the spoon out along the lashes and continue pressing against it for a full curl. 19. Lay a handheld mirror on a table, prop your elbows up, and lean directly over the mirror for a steady false lash application. After you've picked out a pair of voluminous false lashes, such as Andrea Strip Lashes, prop your elbows on the table and lean over the mirror. This positioning will steady shaky hands or arms and also give you a better look at what you're doing. 20. Wrap your false lashes around the handle of a makeup brush to give the strips some curve. That way, they'll form to the shape of your eye more easily. If you can't get the ends of your lash strips to stay glued down, try giving them a little curl first to prevent them from sticking up while you apply them. 21. Apply eyelash glue to false lashes with the tip of a clean cotton swab or bobby pin. To better control the amount of lash glue you're dispersing on the lashes, squeeze some glue onto the tip of a cotton swab or a bobby pin, and then spread it evenly along the base of the strip. Then, wait a few seconds for the glue to get tacky, and apply. 22. Or, try lining your eyes with lash glue instead of directly on the lash strip for easier application. If you tend to fumble around trying to apply glue onto the lash strip, an easier alternative is tracing your upper lash line with glue, letting it dry a few seconds until it's tacky, and then setting the lashes on top. 23. Cut lash strips into halves or thirds for easier application. A longer lash strip is hard to control, so try applying them one section at a time. Start with the outer corners and work your way toward the inner corners. A full lash strip can also be a really intense look, so you might even skip doing the section on the inside of the eye for more natural-looking fringe. 24. After you've applied false lashes, use black liquid liner to blend the strip with your real lashes. Try to set the strip of false lashes as close to your lash line as possible, but if you accidentally leave a gap between the falsies and your real ones — or have noticeable glue imperfections — just cover it up with a thin line of black liquid liner. It's much easier than redoing the entire strip, and no one will notice the difference. 25. To easily remove false lashes, place a cotton ball soaked in eye makeup remover on top of the eyelid for a few seconds to loosen the glue. Instead of pulling the strips off, which tugs at delicate eye skin and might even pull out your real lashes, soak a cotton ball in oil-free eye makeup remover and then hold it over your eye for 20 seconds. This will loosen the glue and the strip, making it much easier to remove. If you don't have a bottle opener handy, you can always use your eyelash curler as a last resort. Just flip it upside down so the top of the curler is under the bottle cap, and then pull back to pop the top. Just be forewarned that your eyelash curler, depending on how strong it is, may or may not be usable again after you do this.